Children's Healthcare of Atlanta and Emory University announce that after 15 years of dedicated service, William G. Woods, MD, has stepped down as director of the Aflac Cancer and Blood Disorders Center of Children's Healthcare of Atlanta and chief of hematology/oncology/BMT in the Department of Pediatrics at Emory University. A nationwide search has identified Douglas Graham, MD, PhD, as the successor to this role. Dr. Graham joined Children's on August 17, 2015, and is working closely with Dr. Woods to ensure a successful transition. "We are so thankful to Dr. Woods for his tremendous contributions to the Aflac Cancer Center," says Heather Davidson, vice president of hematology and oncology, Aflac Cancer Center. "Dr. Woods is a leader of great character, and everyone who has worked with him knows that our program would not be where it is today without his leadership. Under his tenure as director, the Aflac Cancer Center has grown in clinical and research faculty, grant funding, and research publications. His vision has led the Aflac Cancer Center to become one of the largest and most respected pediatric hematology/oncology programs in the country, now ranked by U.S. News & World Report among the top 10 pediatric cancer centers nationwide. He has truly built a legacy here." Dr. Woods remains on faculty with the Aflac Cancer Center and Emory University. His new title is director emeritus. "Dr. Graham brings to Children's a vision for the Aflac Cancer Center to enhance innovation and discovery across our core missions of clinical care, research and teaching," says Dr. Woods. "As we grow our program through new investment, recruitment and integration across our existing clinical and scientific expertise, Dr. Graham brings proven experience leading these missions. We are excited to have him join the team." 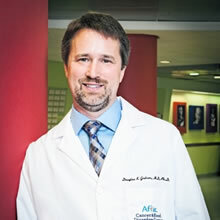 Dr. Graham is a member of the Senior Leadership Council of Winship Cancer Institute of Emory University. He will play a key role in helping to jointly recruit new oncology faculty with Winship. The new director comes to the Aflac Cancer Center having previously served as professor of pediatrics and immunology at the University of Colorado, with clinical practice at Children's Hospital Colorado. While there, Dr. Graham led the Biology and Treatment of Childhood Cancer Research emphasis area. In this capacity, he directly oversaw all basic science, translational and clinical oncology research for the Center for Cancer and Blood Disorders at Children's Hospital Colorado. Dr. Graham is a National Institutes of Health-funded investigator with an active laboratory focusing on developing novel therapeutics for pediatric cancer, recently validating MerTK as a novel cancer agent in leukemia, melanoma, non-small cell lung cancer and glioblastoma. He was the co-program leader of the Hematologic Malignancy Program at the University of Colorado, a National Cancer Institute-designated cancer center.